Why not replace modern agriculture with market gardening? As you know, the problems with modern agriculture are numerous, but the solutions, not so much. Local organic market gardening agriculture can (and will) transform society in positive ways, but the limiting factor is the number of people willing to make a change for their community. Our world needs more small-scale farmers who have an interest in market gardening – like you. Market Gardening for a living? Feeding people locally is hard work, but it can be part of a fulfilling lifestyle with a deep sense of connection with the land, family and your community, says Jean-Martin Fortier, a pioneer in the field of Market Gardening. J-M’s low-tech strategy kept his start-up costs to a minimum, and overhead expenses low. 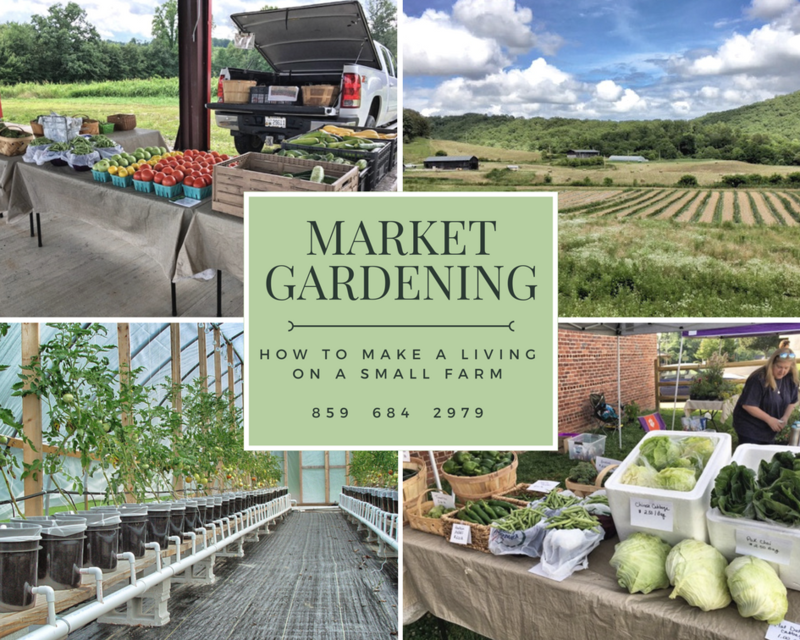 The farm became profitable after only a few years, now with revenues north of $140,000 and margins over 50% — and that is on only an acre and a half — he claims they have never felt the pinch of financial pressure with his market garden business. I’ll say. Farmer’s markets allow growers to sell directly to consumers at a given location and time. This marketing method has grown in popularity. Since USDA’s Agricultural Marketing Service began tracking farmers’ markets in 1994, the number of markets in the United States has grown from 1,755 to 8,144 in 2013, an increase of about 4 percent from the previous year. The states with the most farmers’ markets include California (759), New York (637), Illinois (336), Michigan (331) and Ohio (300). Total annual sales at U.S. farmers’ markets are estimated at $1 billion. Kentucky hasnt even touched the tip of the iceberg yet — this is the opportunity to grow quickly and be the authority in Market Gardening. Why Market Gardening and Farmers Markets? A farmers’ market allows growers the opportunity to market directly to consumers without dealing with a food broker. Growers can explain how the food is grown and educate consumers on how to prepare it. What do I do when it isn’t summer season? Most farmers’ markets are operated on a seasonal basis, opening in the spring and closing in the fall. However, there are year-round markets and they are generally found on the West Coast, southeast and southwest United States. To participate in a year round Farmer’s Market, a grower or vendor, pays a small fee or percent of sales for booth space. The market has a manager that coordinates vendors and promotes the market. The market is held in a public location, such as a town square or downtown street on a weekly basis. Some markets are open in the mornings and others are open in late afternoon. As farmers markets extend the market gardening season and the demand for local food goes year-round, many growers are creating products to take advantage of the new marketing opportunities. These new products and foods and non-food items include things such as baked goods, straw bales, wreaths, candles, etc. This is an amazing way of diversifying your farm’s offerings, extending your selling season, and improving your bottom line. First, identify potential products – that will sell well – and that you like to make. They should be food items that you know and love, because your enthusiasm will be crucial to your marketing success. Maybe you have a favorite family recipe for jalapeno jelly or garlic jelly – or a special love of pesto – or you’re part of the fermentation generation. Choose foods that interest you, and think about a few variations that could be developed into a multiple product line, such as basil pesto, cilantro pesto, and parsley pesto. Experiment in your home kitchen to devise recipes that are delicious, economical, and use ingredients from your own or other local market garden farms – Hint: stick to one type of food process, such as canning, freezing, drying, or baking. Bottom line is there is a ton of opportunity out there and with some enthusiasm and the right piece of property – which I am about to show you… —- you have a recipe for success in your new Market Garden experience. 5 – Find a market niche and expand on your established business by offering products all year long. —— what are YOU going to make for the winter months? With an Artist’s community the next town over – Berea, KY – the sky is the limit. Ready to make the move? Call Ken for more information and to set up an appointment to tour the whole property. CAUTION: Be prepared to fall in love.